This unit covers setting up the call transfer functionality of Fastcall. This must be enabled by Fastcall support. The settings are found under Fastcall Settings > Admin Settings > Call Handling > Call Transfer. Fastcall allows you to change between warm and cold transfers. A cold transfer drops the user making the transfer from the call, and then calls the user the call is transferred to. A warm transfer adds the user the call is transferred to to the call in a three way conference call. You will need to have three way conference calling set up to use warm transfers, there is a separate training unit on this topic in the Advanced Fastcall Module. You cannot use warm transfers on inbound calls in combination with simulring inbound routing rules. If a user has an inbound routing rule that uses simulring, the simulring phone will not ring at all. 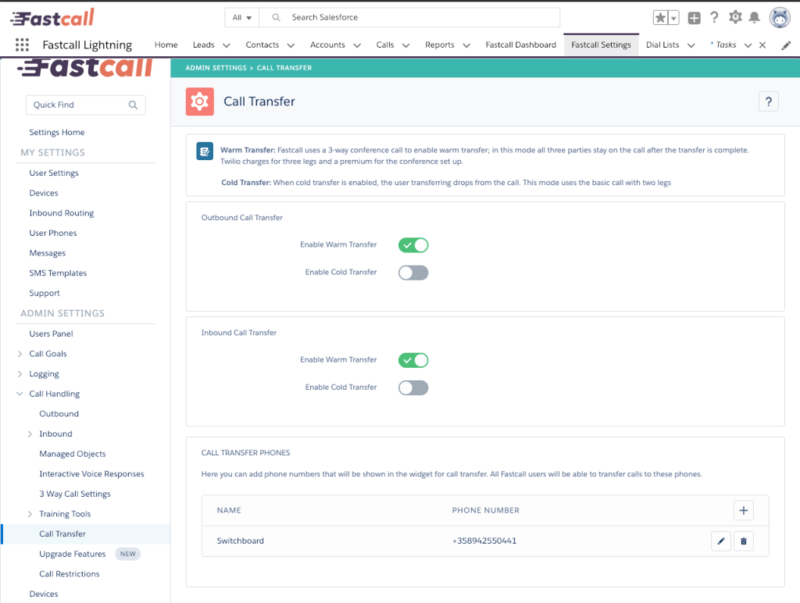 Users can use the Fastcall widget to transfer calls to Fastcall Users, Salesforce Users, Groups or specified Phone Numbers. This setting allows you to control which phone numbers appear under ‘Phone Numbers’ in the Fastcall widget. You do not have to specify any of the other categories.